The Toronto Airport Marriott Hotel will be the venue for the 2017 Entrepreneurial Leaders Conference. The hotel is located at 901 Dixon Road, Toronto, ON M9W 1J5. 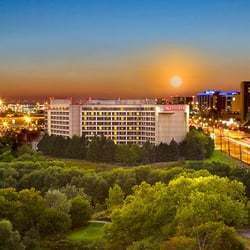 The Marriott offers a peaceful, picturesque location overlooking Royal Woodbine Golf Club - yet only half a mile from Toronto Pearson International Airport, and offers a free shuttle service. Rooms are intuitively designed, offer 24-hour room service and an abundance of natural light, as well as mini-fridges and flat-screen TVs. Sample modern cuisine at Bistro West By East or fuel up for a busy day at our on-site Starbucks®. Additional hotel perks include an indoor pool and a fitness centre, as well as 26,000 square feet of versatile indoor/outdoor venue space. Last but not least, our unbeatable location enables you to visit nearby attractions including the International Centre with ease.